The Lean Body Challenge started on Monday of this week. I've participated in this 2 of the last 3 years and haven't made it to the end. By week 8 I'm almost always looking for a new workout program. I can be such a fickle Gemini sometimes! In addition, I have never followed through with the nutrition for very long. Less time than the workouts, actually. Last year, I took a break from this challenge and did 80 Day Obsession through Beachbody. It was an amazing program that really pushed me and I made it through the entire 80 day program proving to myself that I CAN stick to a program. Again I wasn't really on board with the nutrition but in spite of that I had great results. I'm still a Beachbody member and even my husband likes to do the LIIFT4 workouts. This is a shameless, non-sponsored plug but I do love having so many workouts to follow in the comfort of my own home. If you have a friend that is a coach who has been trying to get you on board, I highly recommend you give it a look at least for the free trial. If you don't have a coach friend let me know and I can hook you up with mine! Mary Rose Swan is the BEST! Anyway... I got a little off track there! I'm fully committed this year to get through the entire LBC program, nutrition and all as a means of getting fit and down to a weight that will optimize my speed for the Mt Charleston Marathon. The program ends right before the marathon which means no time to backtrack. You will all help me stick to it, right? I knew I could count on you. My first week went very well. I got up early every morning for my workout, stayed on plan with my nutrition and limited my intake of beer/wine. My goal is 3 glasses or less. Thursday: Legs; 8x800m repeats (6.5 miles) on the treadmill - don't think I didn't notice that leg days both fell on my hard running workouts. Saturday: Long run day scheduled but I was still sick so I opted to skip again. I hate missing my run! Sunday: That's today and I'm going to go out and get my long run since I'm feeling so much better. Mitch is going with me and we are going to do Black Otter Trail so I will also get the hills I was supposed to do for Sunday. Two birds with one stone! This time of year I sometimes have to get the training on a treadmill. I have many things going on and also working extra hours so the treadmill is better than no training at all. 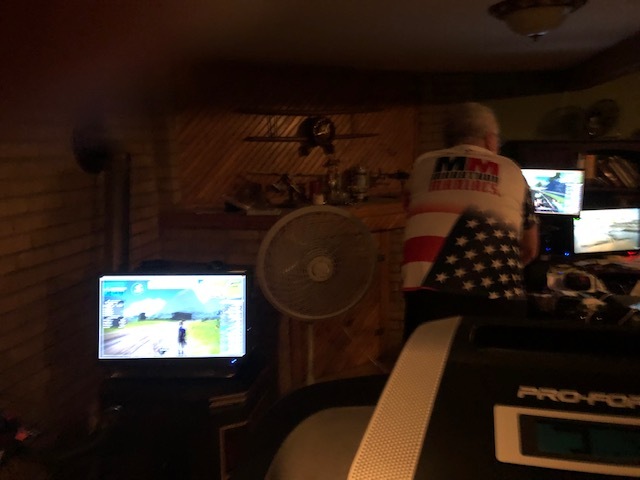 Zwift to the rescue! Treadmills are SO boring. I listen to music or podcasts but I have trouble engaging in TV shows. The online world of fitness is growing fast and I can take a virtual run or ride any time I want on Zwift. We have it set up so Mitch and I can both be working out at the same time. We only have one treadmill, but he can ride while I run or vice versa. One thing I've learned (and often forget) is that I can follow a healthy nutrition plan that fuels my body for the effort I put it through and still love the food I eat. I've always been a bit of a foodie so if I'm not loving the taste of what goes in my mouth I'm probably not going to stay on track. 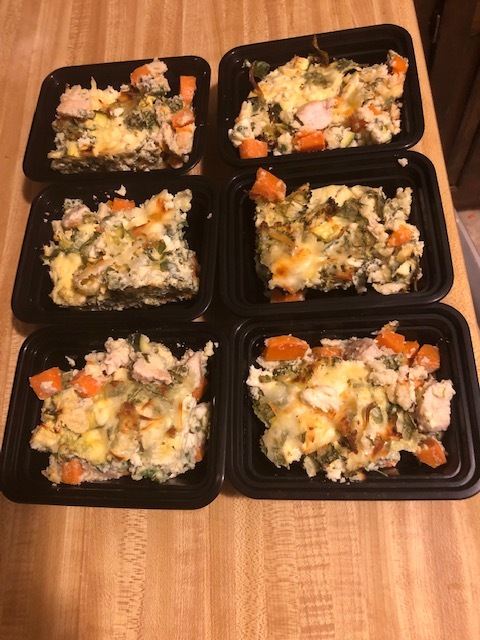 For breakfasts this week I made this Sweet Potato Quiche from Labrada. The recipe calls for 4 foil pans, but I don't find that practical to take to work since I have to microwave my food. I made it in a 9x9 glass casserole pan and made 6 servings. If you do this, increase the cooking time to one hour. I looked forward to my breakfast every day this week! I'm going to make it again today and switch out the chicken for turkey sausage. 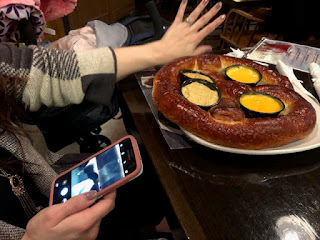 Eating out is usually where I make my worst food choices, but most restaurants have options that don't break the calorie bank. From years of experience I know which places in town have meals I enjoy. We went to BIN119 for lunch yesterday and I was planning to get the Ahi Tuna Salad, which I love. 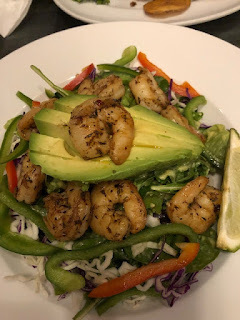 Sadly they took it off the menu but this Caribbean Shrimp Salad was still a delight. That being said, I don't always want salad so at other places I order a lean meat, vegetable and side salad or soup. It does the trick. PS. I love avocados. They are my favorite. I went to lunch at the Montana Brewing Company with my daughter and her family this week. They ordered my favorite mac n' cheese and the biggest pub pretzel I have ever seen! I tried a bite of the pretzel but opted for the seared Ah tuna with pesto which is delicious anyway. What are your Sunday Plans? Avocados - Yes or No?